The Centre provides practical opportunities to reinforce many aspects of the Curriculum, especially Science and Geography. All ages are catered for, from reception classes, through to those studying at tertiary level. All groups are led by experienced members of staff. A link to specific educational courses can be found at the bottom of this page. 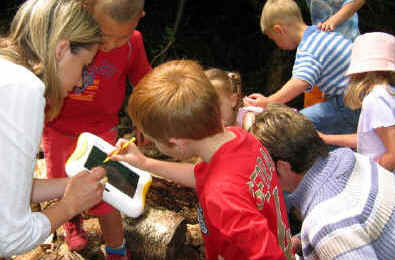 The Woodland Discovery Trail is a unique, new, outdoor activity being offered at the Woodland Education Centre this year. It utilizes the revolutionary, hand-held Q3 Ranger computer system. 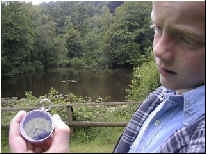 Pupils can investigate minibeasts in a whole range of habitats including woodland trees, leaf litter, rotting wood, under stones and in freshwater habitats. This practical activity covers topics such as:- the decomposers, carnivores and herbivores; metamorphosis, life cycles and food chains. This activity starts in the cabin discovering how to create a good design for a pond. It examines the relationship of plants and animals in the aquatic habitat. Particular reference is made to food chains and the conditions required to support life, as well as to pollution indicators. Pupils produce a map featuring the Centre's classroom, lake and other clearly identifiable features such as a sand quarry. These lie hidden within a steep sided wooded valley. By the end of the activity pupils clearly understand how to use a compass. This activity is highly recommended for top Juniors and GCSE pupils, although it can be adapted for younger children. Older pupils can also do orienteering-type activities. Map resources include the interactive Centre Map, aerial photographs, a geology map and old estate maps. A practical study of woodland ecology, with activities which examine how woodlands work. It examines the processes and conditions needed to sustain life. Food chains and the variety of life in the woodland ecosystem are observed and investigated. The recycling of nutrients, the processes of decay, together with the competition for resources in this habitat are also looked at in detail. An excellent introduction to the natural world for all ages. Since 1986 the reserve has been transformed from 50 acres of sterile rhododendron to a high quality conservation site. The reserve has a remarkable range of habitats. These include heathland, broadleaf and coniferous woodlands, wildflower areas and an important range of wetland habitats. More advanced groups can learn about a range of topics including woodland, heathland and wetland ecology; habitat restoration and ecological sampling. Days can be organised for specialist and general interest groups. These may include fungus forays, birdsong identification, entomology and botany days. During the summer holidays, Family Activity days are held on most Wednesdays. 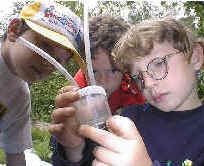 Activities range from shelter building to fossil hunting, rock pooling, night outings and treasure hunts. Please telephone 01404 831 881 for more information.